Skin is the most tender and sensitive part of our body. Since, the skin is sensitive is demands more care and attention in comparison to other body parts. Skin due to its sensitive nature is more prone to different kinds of allergy, natural products and other factors prevailing in the environment. On the other hand, there is no denial to the fact that skin is the only part of our body that reveals beauty and fitness of our body. To some lucky ladies, natural beauty is a gift of god and some earn that beauty by following a dedicated care regime of homemade tips for glowing skin. Maintaining healthy skin is not a joke and takes not so many efforts but everything needs few efforts at least. A large ratio of teenage girls and women are always troubled with some or the other skin issue. The main reason behind their worry is their busy schedule and lifestyle. Their daily busy routine lifestyle doesn’t allow them to give proper care and attention to skin care , resulting in bad and unhealthy skin. And to avoid such situation, they are always on the hunt of some effective commercial beauty product. But instead of going on for some chemically driven beauty product, it is always advisable that go for some home tips for glowing skin. The main benefit of going by the natural way is no chemical reaction and skipping the huge wastage of money. We all know that natural ingredients are never so expensive in comparison to the branded cosmetic and beauty products. And the people who have spent thousands of rupees of their hard earned salary will better understand this pain of wasting money on commercial beauty products. Ahead of the monetary and reaction free advantage, one of the major advantages of the natural ingredient is their availability and usage in many domestic works like cooking, cleaning, washing and other natural ways. Moving ahead of the advantages, there are certain reasons that causes skin damage and other problems to skin like dullness, dryness and many other. Over exposure or direct contact of skin to sun is always harmful. Excess of anything could harm especially if we are talking about sun, the heat and Ultraviolet rays are never behind in damaging the skin even in a short span of time. Hence, unprotected exposure of skin to sun is a major cause of skin damage. Try and cover the skin with clothes or go out with an umbrella before going out in sun. Chemicals have always been the enemy of skin. Whether they are used directly over the skin in the form of any commercial product or the skin came in contact with any harsh chemical used for cleaning of bed sheets or clothes can cause skin irritation. Exposure to harsh chemicals directly or indirectly can cause skin allergy, redness and sensitivity to skin. Hence, be particular and cautious about using any chemical based skin care product and even the products that are washed with heavy detergents. Smoking is never heard in a good sense. Being counted in a bad habit, smoking damages the body in many ways. The first visible damage coming to the body is skin damage. The impact of smoking on skin has become so popular that even a termed called “smokers face” has gone popular amongst the medical industry. The first and the major impact of smoking is contraction of blood vessels that reduces the blood flow to the skin. As a result, the skin becomes dull, dry and fine lines starts making place over the face. Thus, say no to smoking and keep your skin healthy and young. To make things sound simple and easy, free radical are those unstable molecules that carries single unpaired electron. Free radical formation leads to oxidation. And the surprising fact about free radical formation is that it goes forming throughout our daily routine practices and from activities like exposure of skin to air pollution, pesticides and tobacco. Hence, one has to be very careful to deal with free radical formation. The good news to escape from this problem is keeping the body stocked with antioxidant food products and vitamins like Vitamin C and E. Fruits and vegetables like spinach, carrot, berries and citrus fruit are rich in vitamin and antioxidants and restrain the free radical formation. It is very much necessary to pay attention to all the factors and above mentioned reasons of skin damage. If any individual would ignore any kind of skin damage and potential reasons of skin damage in routine life then the damage could go up to the no reversal stage. And in case where the damage reaches the no reversal stage, one has to go through expensive medical surgery. Hence, it is better to pay attention on time and give natural care to skin rather than going for skin treatment surgery. To bring back the natural beauty, the best way is to follow homemade tips for glowing skin.If the beauty tips are incorporated in the skin care regime then the skin will remain healthy, beautiful and radiant all the time. Tea lovers, there is a good and aromatic face pack to make your skin beautiful naturally. As the tea gives a fresh start to many people in the morning, it could give a refreshing and rejuvenating experience to the skin. Keep the tea water stored in a bottle as a spray or give a tea water bath to the skin; it’s all up to your choice. And to double the benefit of tea water, bring in some rice flour and honey. Prepare the honey and tea water pack by mixing 1 cup of cooled down tea water, two tablespoon of rice flour and half tablespoon of honey. Honey acts as a moisturizer and rice flour works as gentle scrub in this pack. Apply the mask over skin and keep it for 20 minutes till it dry. At the end, wash the face with cold water to get refreshed and soft skin. Saffron is popular in the street of beauty for its fairness magic. Yes, it is little expensive in comparison to other natural beauty ingredients, but it is worth for every penny spent on it. Also, saffron is used in many beauty creams and bleach like Fem Fairness Naturals Saffron Bleach . So, the fact is very clear that saffron is an effective ingredient to get glowing skin naturally. On the other end, milk is good for making the skin moist and supple. Make an ultimate beauty pack of milk and saffron by adding few strands of saffron in a bowl of milk. Let the saffron stay in milk for few hours and then apply the pack over clean face. Keep the pack over facial skin and neck for 20-25 minutes and then rinse the skin with lukewarm water. If the fresh and vibrant skin is your desire then potato is the right ingredient to fulfill your desire. Potato is useful to its very end, this point out the potato peels, which we throw after taking the real clean potato in use. The potato peels can work as a great scrub for the skin removing out the dead cells and all the dirty particles from the skin. Application of potato juice or pulp over the skin everyday for around 15-20 minutes will give flawless and radiant skin. Don’t forget to wash the skin with normal and clean water. The goodness of papaya in skin affair is very well known to our elders or our grandparents. Thanks to the papain enzyme that kills away all the bacteria and deeply cleanse the skin. Talking about the fuller earth also known as Multani Mitti in Indian culture acts like a calm and soothing agent. Fuller earth pack is more beneficial to people who have oily skin. To make the papaya and fuller earth pack, take one tablespoon of papaya pulp and one tablespoon of fuller earth in a container. Mix both the ingredients well and apply the pack over clean skin. Let the pack dry till 20-25 minutes and then wash off the skin with normal water. To remove the blemishes and kick off the dull skin, make a lemon and yogurt beauty pack at home. The amazing combination of lemon and yogurt is helpful in providing the luster and softness to skin. The pack even helps in reducing the dark spots and acne marks from skin, so underestimate the potential of this small and simple natural beauty pack. To prepare the pack, you’ll need one tablespoon of fresh yogurt and lemon juice. Mix both the ingredients to obtain a smooth mixture and then apply then apply it over facial skin and neck. Remember to clean the skin before applying this pack and let the pack sit over skin for 20 minutes. To clean the skin, use normal water. Lemon and yogurt pack is considered one of the easiest home tips of glowing skin . In the polluting environment and increasing reasons of skin damage, managing and keeping the skin healthy and beautiful has become a really tough task. 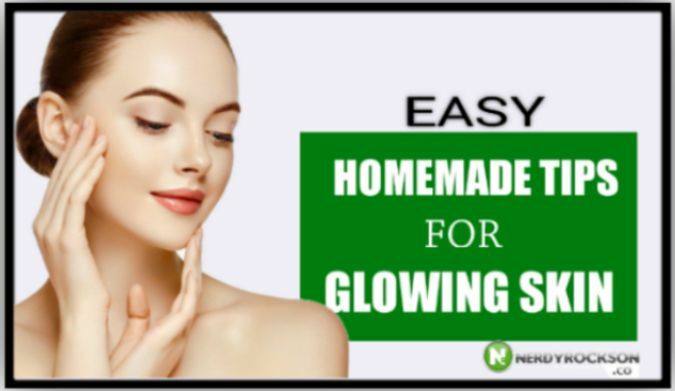 But if one follows the homemade tips for glowing skin dedicatedly on regular intervals then the skin problems won’t get much space is grow and cause trouble. So, rather than going to skin specialist or any skin treatment center, start giving a little time to skincare at home. Read our blogs to know more about how to get fair & glowing skin at home.